Thomas Built is in it for the long haul. And the short haul. Thomas Built city and commercial buses are ideal for both long trips and in-town routes. 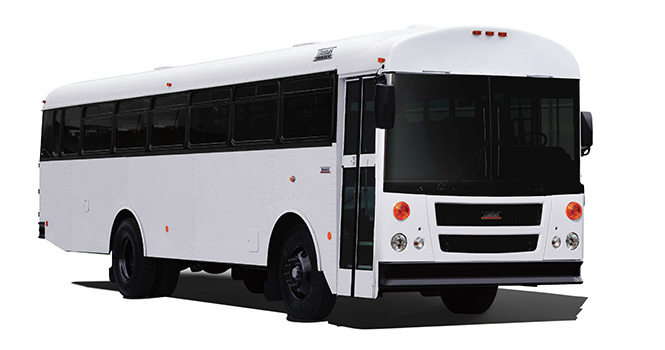 The versatile Transit-Liner® EFX bus keeps up to 56 passengers comfortable and secure. Thomas designed the cockpit for driver comfort and safety, with ample leg room and optimized access to controls. Our engine cover allows quick, tool-free access to the engine, fluids and belts, keeping routine maintenance time to a minimum. The EFX activity bus was designed after listening to drivers and mechanics, so we could help maximize efficiency. And with one of the most extensive dealer networks in the industry, you’ll always have support nearby.